Victorinox Swiss Army , widely known to the general public for its “Swiss Army Knife” and for being the Swiss Army’s official supplier, produced their first wristwatch back in 1989. This year, to celebrate 25 years in the watch replica making industry, Victorinox released a new version of the Dive Master: a professional timepiece, in a 500 pieces limited edition, the first ever limited edition timepiece released by the brand: the Victorinox Dive Master 500 . This model is Victorinox ‘s very first timepiece operated by an automatic chrono movement and by the reliable ETA 2894-2 caliber. It supports a 43mm wide grade 2 titanium sandblasted case, and has a highly luminescent 20 minute scale on the bezel, plus a transparent sapphire crystal case back. One of the most interesting features is that the 20 minute scale on the bezel glows blue in the dark, while the corresponding side on the rehaut glows green. The minute hand also glows blue while the hour hand glows green. The same green color is used for the two small rings around the 30 minute counter at the 9 and the 12 hour counter at the 6, a set of features which, together with the water resistance (500 meters) and the helium escape valve placed on the carrure at the 9, make this timepiece one of the most eagerly awaited for by professional divers. 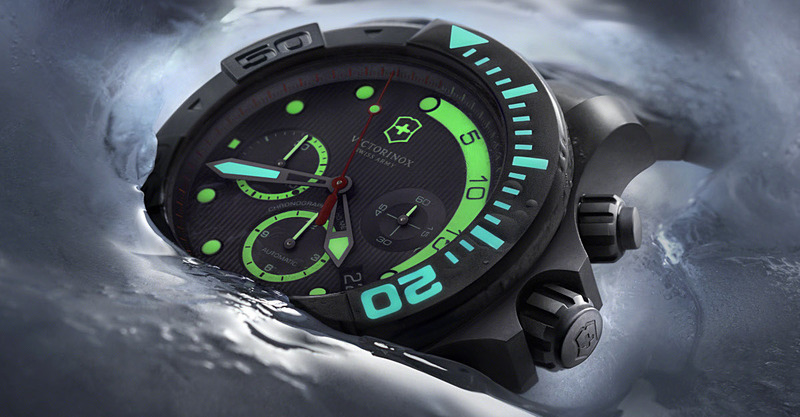 The Victorinox Dive Master 500 ‘s price tag is 2,770€, and it will be available in summer 2014. My personal review, instead, will be available directly to you in a couple of weeks at Baselworld 2014. UPDATE : our hands on Review HERE ! Next article Visconti W115 Abyssus Full-Dive Inox – Italy, is this a country of…Watches Replicamakers?